"Fair Anchorage was a small campaign with few assets, but with NEAT we were able to capitalize on the community that came together to defeat our anti-transgender ballot proposition. Without NEAT's support and expertise in volunteer coordination and field, we wouldn't have been able to accomplish the incredible volunteer program that allowed us to win against hate." "Working with NEAT allowed the Yes on 3 campaign to help our coalition partners help us! From the convenience of their own office or home, coalition partners could call Massachusetts voters on our behalf and advocate for a 'Yes' vote on election day. Brian was extremely flexible and helpful during our campaign. He was more than willing to adjust his process to meet my needs. I would definitely recommend NEAT." "The Yes on 3 campaign needed help managing the hundreds of people who wanted to volunteer with us every week. Because of NEAT, we were able to give them a simple, quick way to get involved and protect transgender equality. Because of NEAT, we were able to build the massive team we needed to defend protections for transgender people in the first ever statewide vote on transgender equality." 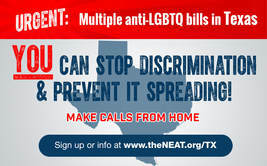 "NEAT was integral in our campaign to pass a Human Rights Ordinance in Jacksonville, Florida. We have a huge Florida membership and with NEAT's help we were able to engage members in Miami, Tampa, Orlando and all across Florida to virtually advocate for their queer community in Jacksonville. We were able to vastly expand our field operations thanks to NEAT!" "NEAT has been pivotal to SAVE's year-round organizing. It gives us the ability to rally our volunteers to the most urgent campaigns facing the country. Having a place and issues to train our volunteers on ensures that we always have a strong base of leaders that are ready to go on the ground here in Miami when it's time for us to run our own campaign." Support the repeal of HB2 which, amongst other negative policies, outlawed local non-discrimination ordinances and transgender bathroom access. Add transgender public accommodation protections to current state law. ** Prior to NEAT being permanently established in 2012, it was envisioned as a one-time campaign led by Marriage Equality USA called the "20 Million More Campaign" to work on the ballot initiatives in Maine, Maryland, Minnesota and Washington.